Before the 2016 election, candidate Donald Trump told voters he would ‘find out who really knocked down the World Trade Center’. His promise may turn out to be as empty as his predecessor’s undertaking to close down Guantánamo Bay. Or he may be prevented from keeping it – by those who know the truth. Trump, an expert in false facts, questioned the version of events provided by the 9/11 Commission report. More significantly, so did many scientists, engineers, and intelligence analysts. Experts from a wide range of countries at the 2011 Toronto Hearings on 9/11 produced a DVD two years later, subtitled ‘Uncovering ten years of deception’. There have been several books, including those by David Ray Griffin, Peter Dale Scott, Paul Thompson and Nafeez Ahmed, but many still cannot believe these accounts. When Secretary of State Madeleine Albright was asked in May 1996 if the deaths of half a million Arab children following Gulf War I were justified, she infamously replied, ‘I think this is a very hard choice, but the price – we think the price is worth it’. Most of the people who died on and after 11 September 2001 were not Arabs or children, yet their 3000-plus deaths were seen to be worth more than those of many hundreds of thousands in the Middle East. They caused much greater international outrage than the deaths that followed in Iraq. The United States war of retribution killed and injured uncounted civilians in Afghanistan, Iraq, Libya, Yemen, Sudan, and Syria, and is still doing so. On a rough calculation, each of the New York and Washington deaths was worth at least 30 Iraqis. Were any of these deaths ‘worth it’? Or worth the $US 7 trillion plus cost of the war? In April 2018 a group of American lawyers who thought not petitioned the Administration to reopen the 9/11 inquiry. In July 2018, five years after the report of the Toronto Hearings appeared, the same question was raised in a series of open letters to President Trump. These letters have attracted surprisingly little media notice except among readers of the online American Herald Tribune. The writers are qualified and serious, and the conspiracy they all suspect is far from theoretical. Barbara Honegger, a White House policy analyst to President Ronald Reagan and senior military affairs writer for the Naval Postgraduate School, informs Trump in her open letter that the ‘Official Story of the Pentagon is false in every respect’. She shows that: the attack happened almost eight minutes earlier than the report stated; military officers reported smelling cordite before the impact; major destruction was not due to a plane collision but to pre-planted explosives; if there was a plane, it was smaller than a 757, so it was not American Airlines 77; that flight was not mentioned until 15 September (so what happened to it? ); and its flight path was different from what was reported. Honegger’s clinching arguments are that the deaths and destructive fire occurred in the two inner rings of the Pentagon, not in the outer ring; and columns were left standing in the outer ring right where a 757 was supposed to have hit the building. Turning to the World Trade Center, Honegger asserts that explosions occurred in the basement of both towers before the planes hit them: 14 seconds before for WTC1 and 17 seconds for WTC2. She has produced a documentary, Behind the Smoke Curtain, which claims Vice President Cheney and Defense Secretary Rumsfeld led US collaboration with Israel in the attacks to provide a pretext for war against Iraq, planned by the neo-cons since 1991, (quoting General Wesley Clark in 2007). Another letter writer to Trump, Scott Bennett, a military officer, was (like Edward Snowden) a contractor for Booz Allen Hamilton. He was assigned to US Central Command to keep track of terrorists’ sources of funds, as well as to investigate $US 2.3 trillion allegedly misappropriated by Dov Zakheim, who was US Terrorist Financing Operations Director and Bennett’s superior. Bennett suspected that an Iraqi linked to Rudy Giuliani and to Zakheim’s son, a lawyer on the House Armed Services Committee, were also involved. ‘Conveniently’, Bennett writes, the auditors working on this in the Office of Naval Intelligence were killed on 9/11 when ‘a missile’ hit the Pentagon in ‘a false-flag attack on American soil’. Susan Lindauer had been a journalist and was a Congressional staffer when she met and befriended a CIA officer in Washington. She writes in Extreme Prejudice: The Terrifying Story of the Patriot Act and the Cover-Ups of 9/11 and Iraq (2010) what this man told her in April 2001: the CIA expected a major terrorist air attack on the WTC in three or four months, which might include a mini-nuclear device. She was to warn Iraqi diplomats that, if Baghdad was found to have knowledge of the device, there was a threat of war against Iraq. She also warned an academic friend, Parke Godfrey, to get his family out of New York. For ‘acting as an unregistered agent of a foreign government’ before the 2003 Iraq invasion, Lindauer was indicted in 2004 and held without trial in a mental facility in 2005-6 until she was found ‘mentally unfit’ to stand trial. Godfrey told the court she was sane, and had refused to take psychiatric medication which she feared would disable her. The prosecution was dropped in 2009. Since then, Lindauer has been an anti-war activist and, perhaps unsurprisingly, a critic of the US Government and a letter writer to Trump. A fourth of the July letter writers is Canadian academic Peter Dale Scott, best known for his accounts of the Deep State. He told Trump that Dallas 1963, Watergate 1972-74, and 9/11 were Deep Events resulting in the permanent militarisation of the US. 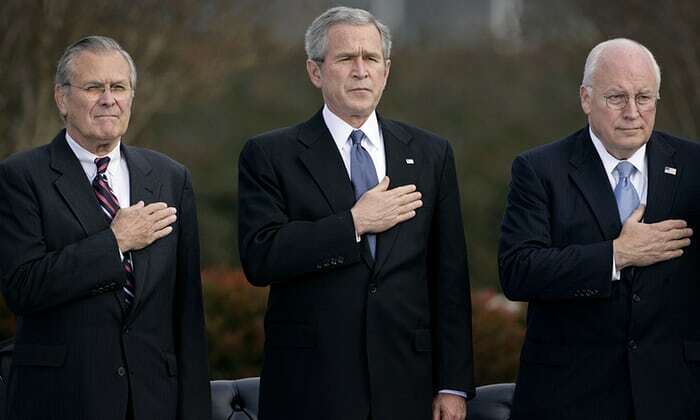 He claims Vice President Cheney ordered President Bush and Attorney-General Ashcroft out of Washington in advance of 9/11, which Scott argues the Vice President had planned with Rumsfeld for two decades. The Toronto conference uncovered ten years of deception and ‘state crimes against democracy’ which beggar belief. The letter writers to Trump reveal more, matters which are, of course, still disputed. People who know ‘who knocked down the WTC’ may well be working now to stop Trump keeping his promise to find out. * Dr Alison Broinowski FAIIA is a former Australian diplomat and is writing her sixth monograph, a book on terrorism. She is vice president of Honest History and vice president of Australians for War Powers Reform. Her many posts on the Honest History site can be found using our Search engine. I have been closely following the Trump phenomenon since before he won the Republican primary. Trump intends fundamental and lasting change in both the US and globally, primarily through the removal of the corrupt and downright evil elements that have infected US Government, Intel, Law and Order and Wall Street.Trump is fighting all comers and there is a line up of willing opponents. However the landscape will change fundamentally after November 2018 when he will achieve a supermajority and relegate the Democrats to a minor party status. With his administration secure Trump will turn to some of the more delicate issues. Rest assured 911 is a huge issue for Trump. He builds towers, he knows the truth. Listen to his comments while interviewed on the morning of 9/11/01 after both towers had collapsed. The most telling comments start at 5.18. You can be assured after the November midterms Trump will start moving on many fronts, including a new investigation on 911.